A bean pie is a sweet custard pie whose filling consists of mashed beans, usually navy bean, sugar, eggs, milk, butter, and spices. Common spices and flavorings include vanilla, cinnamon and nutmeg. Variations can include cloves and ginger. Variations of the pie are popular in South America. 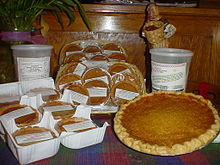 Bean pies are commonly associated with African American Muslim cuisine as an alternative to Soul Food, except those containing vanilla extract or imitation vanilla extract because they contain alcohol. The pies are also associated with the Nation of Islam movement and Elijah Muhammad, who encouraged their consumption instead of richer foods associated with soul food. Members of the community commonly sell bean pies as part of their fundraising efforts. Umrani, Anthony (15 February 2012). "The sweet appeal of the Nation of Islam's bean pie". CNN. Archived from the original on 3 April 2015. Retrieved 2 April 2015. Shula, Mike (18 November 2013). "Bean pie, my brother?". Chicago Reader. Retrieved 2 April 2015. ^ a b "No Fail Bean Pie Recipe". Allrecipes. Retrieved 2016-06-17. ^ Navy bean pie Food.com. Retrieved January 2, 2016.